The reason that we have a dishwasher in our homes is just so we don’t have to do dirty dishes and can free up our time to do something way more interesting. But when the dishwasher stops draining water and refuses to work do you know what to do? One of the ways to avoid this issue occuring is to have your dishwasher properly serviced and maintained by an expert, and preferably on a regular basis, you are less likely to have any problems if you ensure that your dishwasher is in top working condition at all times. However you cannot prevent every issue and there are a few things that you can do if you discover that your dishwasher has stopped draining to limp through before you call in the professionals. There are selected brands of dishwashers that need to have just a small amount of water in the bottom of the washer whilst there are others that don’t have this requirement. The dishwashers that do need this amount of water need it to keep moisture in the pump module and to stop the seal of the pump becoming dry. The way that you can tell if there is a problem with the drainage of your washing machine is that if the level of the water is higher than the pump module then there is definitely a problem. 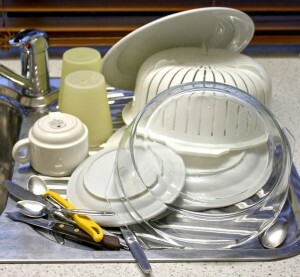 A dishwasher will not drain if the door isnt securely shut and latched – check and see if it is properly closed. Most dishwashers will have a cancel/drain button, depress this to see if you can manually encourage it to use a drain cycle to empty. Is there an obstruction or kink in the drain hose? This could be the cause of the problem. If the loop of the drain hose is more than 20 inches off the floor you could experience problems. Disconnect the hose and reloop it not far from the floor and reconnect it.